You are at:Home»General»Bob Fenner Interview!!! It’s my great pleasure to bring you yet another interview with one of the aquarium world’s most well known authors/hobbyist. Mr. Bob Fenner is our guest this time around. AquaNerd: First of all, what have you been up to lately? Any new projects, presentations, etc? Bob Fenner: Am out presently in Singapore, attending Aquarama… the industry trade show… off to a farm tour on the morrow… Just ahead of this was out in Sulawesi/Indo. with Rob Bray, friend who owns/runs “House of Fins” in Conn… diving, making pix… am writing more or less continuously… mostly independent submission articles for the pet-fish and dive-adventure genres… Two weeks back was in London, Ontario/Canada at the 50th anniversary gathering of the CAOAC giving pitches… on Candiru Catfishes (basically), FW Algae…. and chatting with many fine folk there including visitors/fellow presenters Heiko Bleher and Gary Lange… the week before that in Michigan giving some four pitches in three days! AquaNerd: What possessed you to get started in this hobby? AquaNerd: What possessed you to pursue a career that is so closely tied to the aquarium industry? Also, can you tell us what exactly your “career” consists of? AquaNerd:Hhow many books/articles have you written, and which is your favorite or most helpful? Bob Fenner: Mmm, some nine “books”, several hundred articles… likely the Conscientious Marine Aquarist as my fave… but I want to clearly state that there are easily a handful of other people who should get credit for its utility and beauty… for layout, photo-work, editing… This is the only work I have been involved w/ that has had more than “one edition”. AquaNerd: What are your thoughts on aquarium filtration? like which one is your favorite/most effective? AquaNerd: What other hobbies or activities do you partake of when not wrapped up in aquariums? AquaNerd: What is the best source to learn about aquariums and corals? 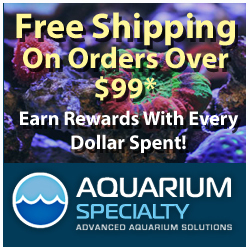 AquaNerd: In closing, what advice do you have for aspiring reefkeepers? AquaNerd: Thank you so much for your advice and contribution to the hobby. Best of luck with everything and thanks again.